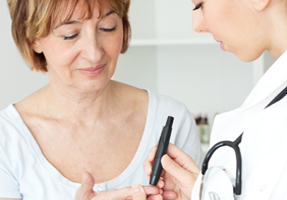 Type 2 diabetes, the most common form of diabetes, occurs when the pancreas does not produce enough insulin, or when the body does not effectively use the insulin that is produced. Pre-diabetic is the term used to describe patients with elevated glucose levels who are at high risk to go on to develop diabetes. Many healthcare experts believe that you can control diabetes — or even prevent it — with lifestyle changes, including healthy eating, maintaining a healthy weight, and getting adequate physical activity. Using Physiomed Healthscore, our proprietary health assessment tool, we can identify risk factors that will tell us if you are at high risk to develop type 2 diabetes. We can then develop a personalized exercise and nutrition program to help you reduce your risk of developing the disease. If you’ve already been diagnosed with diabetes, Physiomed can help you take the steps you need to take to live a full, active life. Prescribe a clinical conditioning exercise treatment program, to ensure that you are getting the physical activity you need, under the care of a trained healthcare professional. Physical activity can help lower your blood glucose levels, maintain a healthy weight and reduce stress. If you’ve been diagnosed with Diabetes or think you may be at risk, book an appointment today.